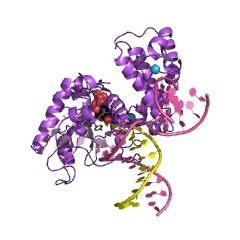 Polbase - Reference: Structure of DNA polymerase beta with the mutagenic DNA lesion 8-oxodeoxyguanine reveals structural insights into its coding potential. Structure of DNA polymerase beta with the mutagenic DNA lesion 8-oxodeoxyguanine reveals structural insights into its coding potential. Oxidative damage to DNA generates 8-oxo-7,8-dihydro-2'-deoxyguanosine (8-oxodG). During DNA replication and repair synthesis, 8-oxodG can pair with cytosine or adenine. The ability to accurately replicate through this lesion depends on the DNA polymerase. We report the first structure of a polymerase with a promutagenic DNA lesion, 8-oxodG, in the confines of its active site. The modified guanine residue is in an anti conformation and forms Watson-Crick hydrogen bonds with an incoming dCTP. 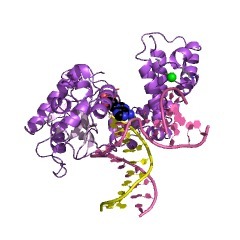 To accommodate the oxygen at C8, the 5'-phosphate backbone of the templating nucleotide flips 180 degrees. Thus, the flexibility of the template sugar-phosphate backbone near the polymerase active site is one parameter that influences the anti-syn equilibrium of 8-oxodG. Our results provide insights into the mechanisms employed by polymerases to select the complementary dNTP.